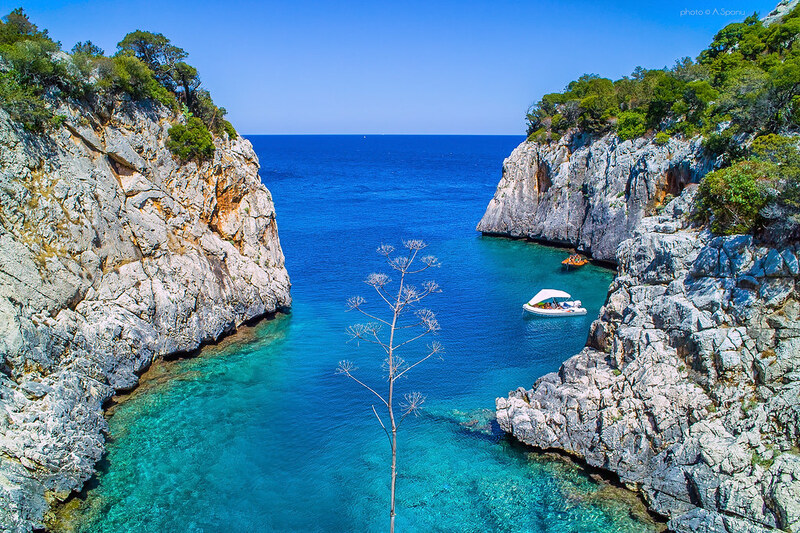 Cala Goloritzè is often considered the last point of interest in the south part of the Gulf of Orosei for those leaving from Cala Gonone. Carrying on the famous and protected beach, there are still 7 km of coastline that separate us from "Capo Monte Santo". Near the latter, there are two small coves that penetrate for a few hundred meters inside the cliff. Although not as extensive as the Norwegian fjords, we assure you that their own charm is unique.The first fjord is said Portu Quatu (hidden port) or Cala Scirocco and the second is Portu Pedrosu (port rocky) or Cala Tramontana. Alternate names related to the winds (sirocco and tramontana), suggest the orientation of the entrance of the creeks that offer protection from the waves, respectively, from south-east and the north-east. The deep waters of Portu Quau hide inside the sad event of the "Levante", a cargo ship which sank in the 70s due to adverse sea conditions. Snorkeling in the waters of this fjord is fascinating because you can recognize to 10 meters deep, the profile of the hull of the boat sank, the motors and the load carrying. You can observe colonies of bream who live near the wreck. The fjord of Portu Pedrosu is initially very wide and narrows near the shore up to two meters. On land there are ancient junipers and a wooden table. The white limestone rocks and walls of the fjord in contrast with the emerald green water make Portu Pedrosu a unique scenario. The fjords are easily reachable in good sea conditions. Some boat rental companies reach the fjords during their mini-cruise charter on the gulf. Click here to " contact the boat rental companies. Click to open "EVENTS CALENDAR 2018"